Alongside mystery plays, there is a tradition of country drama 'mummers' plays. These folk dramas also involve travelling bands of local performers, and the stories, although at first glance appearing to be more secular, share the themes of resurrection and the triumph of good over evil with the passion and mystery plays. Mike Sparks' modern language piece draws on these traditions - a folk drama of the Easter story, acted by local people, travelling to different venues, and combining performance, celebration and worship. Here in Holy Week we deal with one of the major planks of the Christian religion. The mystery play format enables us to look at what went on around the main events and how the ordinary people who had been involved, perhaps only on the fringes, might have viewed what was happening. How did it affect them, their lives, and the lives of those around them? Can we add to the understanding of events by looking at them through different people�s eyes? 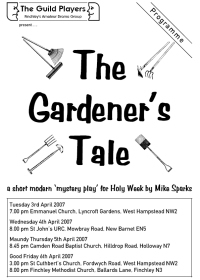 "The Gardener's Tale" follows on from our previous productions, "The Soldiers Tale" and "An Inn Keeper's Tale" , in trying to do this in a straightforward and accessible way, without losing the impact of the story.